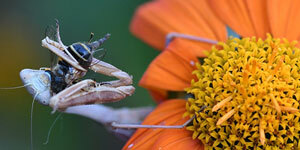 “Bring It Home: Urban Entomology” is the first weekend open house of the year at the Bohart. This edition will feature “all the wonderful household pests/friends and garden pests, along with the kinds of things they inspect restaurants for,” said entomology professor Lynn Kimsey, museum director. The open house is family friendly, with an arts and crafts activity, and the Bohart petting zoo with its Madagascar hissing cockroaches, walking sticks, tarantulas and praying mantids. The gift shop will be open, stocked with T-shirts, sweatshirts, books, jewelry, posters, insect-collecting equipment and insect-themed candy.